Normally the immune response is restricted to the peripheral secondary lymphoid organs. However, additional ectopic lymphoid tissue may develop at chronic sites of inflammation. In the synovium of rheumatoid arthritis patients the local production of proinflammatory cytokines seems to support the formation of a precisely structured microenvironment, which allows an antigen dependent immune response to take place. The analysis of the V-gene repertoire expressed in synovial B cells demonstrated that in the inflamed synovium a germinal centre reaction takes place. Antigen presented by a network of follicular dendritic cells may activate synovial B cells and support their differentiation into plasma cells secreting high affinity antibodies. The specificity of these antibodies remains to be determined. Despite intensive efforts we still have no clear idea regarding what induces inflammation in synovial membrane. This inflammation may result in hyperplasia of synoviocytes, infiltration of mononuclear cells, neoangiogenesis, pannus formation and finally joint destruction. One major problem in investigating the induction and progression of this chronic inflammation is that there is great heterogeneity from patient to patient in the appearance of the chronically inflamed synovial tissue (ST) . One relatively constant feature, however, is the appearance of infiltrating lymphocytes in the majority of inflamed ST specimens [2,3]. These infiltrates are often diffuse and lack a distinct structural organization. Small clusters of T and B cells may be seen in the vicinity of the vasculature and plasma cells may accumulate in the inflamed tissue. In about 10% of the patients, though, the infiltrating lymphocytes become organized into large follicle-like structures, suggesting the development of so-called tertiary lymphoid tissue. The main cellular component in these structures is activated B cells, which can differentiate locally into plasma cells. Molecular analysis demonstrates that these B cells take part in an antigen-driven specific immune response in this ectopic lymphoid tissue [4,5,6]. The unresolved question is whether this is an autoimmune reaction directly related to the pathogenesis of rheumatoid arthritis (RA) or whether it is merely a bystander effect induced by the chronic inflammation. This review briefly describes our current knowledge of the immune processes that take place in the synovial membrane of patients with RA. The normal synovium is a relatively acellular structure, containing a thin lining layer of synoviocytes. The sublining is made up of an extracellular matrix in which blood vessels and a scattering of fat cells, fibroblasts and occasionally mononuclear cells are embedded. The picture is quite different for inflamed synovium of patients with RA , in which there is an extensive infiltration of macrophages, T and B cells into the sublining region. In many such patients, large perivascular cellular aggregates form, which have a well-organized follicle-like structure (Fig. 1). In these large infiltrates the main cellular components are B cells (Fig. 1a), and three different subsets can readily be distinguished. 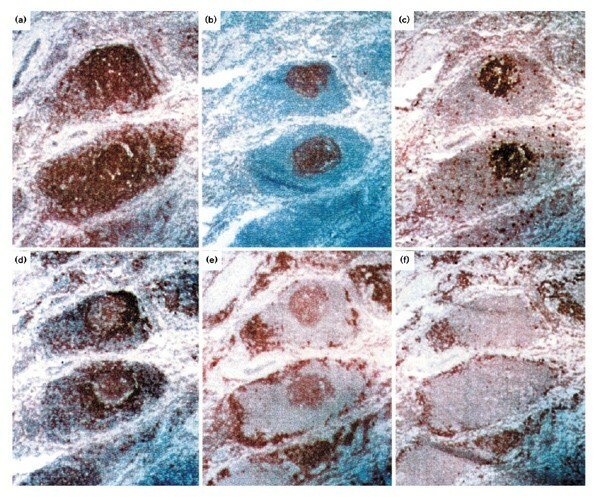 These subsets are as follows: terminally differentiated plasma cells that surround the follicular structures (Fig. 1f); mature CD20+ B cells that are in close interaction with CD4+ helper T cells; and activated B cells that have a germinal centre (GC) phenotype (Fig. 1b1c1d1e), which proliferate in a network of follicular dendritic cells (FDCs) in the middle of the follicle-like structure (summarized in Table 1). Organization of B lymphocytes in synovial follicular structures. Labelling of serial sections with antibodies specific for (a) CD20, (b) follicular dendritic cells, (c) Ki67, (d) CD79, (e) CD38 and (f) plasma cells. Original magnification 100×. FDC, follicular dendritic cell; GC, germinal centre. In organ-specific autoimmune diseases the development of ectopic GCs is frequently observed within the affected tissue [8,9,10]. It is likely that proinflammatory cytokines, such as tumour necrosis factor-α, that are found in the areas of chronic inflammation play a major role in the formation of additional lymphoid tissue . Immigrating B cells may further promote the organization of GCs in the inflamed tissue. B cells express the proinflammatory cytokine lymphotoxin-α as a membrane bound lymphotoxin-α/lymphotoxin-β heterotrimer or as a soluble lymphotoxin-α homotrimer. Analyses of immune-deficient mice [12,13] have demonstrated that only in the presence of lymphotoxin-α-expressing B cells does a network of FDCs develop. Thus, B cells themselves produce cytokines that are essential for the formation of GCs. A normal GC is a highly organized structure within which the affinity maturation of the humoral immune response takes place [14,15,16]. In a T-cell-dependent immune response these structures develop from the primary B-cell follicles of the peripheral lymphoid organs, such as the spleen and the lymph nodes. In a fully developed GC a dark and a light zone can be distinguished [17,18]. In the dark zone antigen-activated B cells proliferate and the somatic hypermutation mechanism is switched on, allowing single nucleotide exchanges to be introduced into the rearranged V-region genes [15,16]. By this means a single activated B cell that is recruited into the GC gives rise to multiple variants, each of which may have a different affinity for the antigen. The light zone consists of a network of FDCs. These are highly specialized cells that present antigen-antibody complexes bound via the Fc or the complement receptor on their surface. It is thought that competition for the antigen determines which of the B-cell variants are selected for further differentiation and survival and which will die through apoptosis . Only those B cells with a high-affinity receptor will receive the signals necessary for differentiation into plasma or memory cells. Classical GCs with a distinguishable dark and light zone are seen only rarely in inflamed ST [19,20]. The proliferating B cells that express a GC phenotype are embedded within the network of FDCs  even in large synovial cell clusters, which may contain several thousand cells. A similar picture has been described for splenic GCs in mice that are deficient for the chemokine receptor CXCR5 [21,22]. In such mice no primary follicles develop, but when a T-cell-dependent immune response is induced ectopic GCs develop in the T-cell zone of the spleen . The antigen-activated B cells proliferate and differentiate in a network of FDCs. Thus, in these CXCR5-deficient mice the process of affinity maturation occurs independently of the development of a dark and a light zone. To determine whether the synovial lymphoid structures can support a GC reaction, the subset of synovial follicular B cells (Table 1) that express a GC phenotype was isolated directly from frozen tissue sections, DNA was prepared, and the rearranged V-region genes were amplified, cloned and sequenced . The overall finding was that a heterogeneous population of B cells that express a broad spectrum of V-gene rearrangements accumulates within the network of FDCs. For example, when 50 individual B cells were dissected from the network of FDCs in a single follicular structure, 13 different VH, five Vλ and two Vκ functional rearrangements were recovered. By comparison with the known human germline genes it is clear that the majority of these sequences (16 out of 20) were unmutated. These B cells therefore appeared to be recent immigrants from the peripheral blood, and had been activated by antigen presented on the FDCs. The finding of sequences with an identical V(D)J rearrangement, but with a different pattern of somatic mutations suggested that a few activated B cells can be channelled by the FDC network into a GC reaction. In each of the follicular structures examined  there was only an oligoclonal population of B cells in which the hypermutation mechanism was activated. Figure 2 shows the intraclonal diversification of synovial B cell clones isolated from the network of FDCs. The mutational pattern suggests that both naïve and memory cells are selected into a GC reaction. 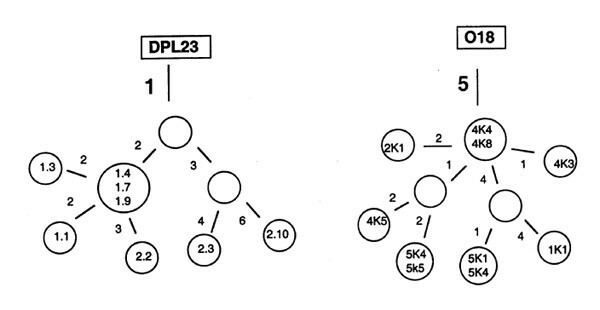 In the Vλ DPL23 rearrangement all sequences had only a single somatic mutation in common, indicating that a naïve B cell was activated in the synovial follicular structure. During proliferation in the network of FDCs, up to nine additional nucleotide exchanges accumulated. In contrast, the genealogical tree of a Vκ O18 rearrangement suggested that the clone developed from a memory cell, because all sequences had five somatic mutations in common. The rate of hypermutation has been estimated to be around 10-3/base pair per generation . If the activated B cells have a division time of approximately 8h  then one would expect roughly one substitution each day in a V-gene of 300 nucleotides. Thus, the finding of sequences that have accumulated up to nine nucleotide exchanges during clonal expansion in the ST demonstrates the enormous proliferative capacity of the activated B cell. A single synovial B cell can generate clones numbering several thousand cells within a week. The majority of these cells are presumably not selected and will die through apoptosis. A few will differentiate into plasma cells or perhaps into memory cells, however. An analysis of the functional in-frame V-genes expressed in the ST was iperformed. The summary of 134 different VH, 31 different Vλ and 21 different Vκ rearrangements [4,5] clearly showed that a broad spectrum of V-genes is expressed in synovial B cells. For example, the majority (80%) of the known human VH3 genes were found to be expressed in synovial B cells (Fig. 3). The frequency with which these various VH3 sequences were found was non-random. Thus, out of a total of 66 VH3 sequences examined, 19 were from the VH gene 3-23 and 15 from the closely related sequences 3-30, 3-30.3, 3-30.5 and 3-33. Inaddition, the VH4 genes 4-39 and 4-59 and the VH5 gene 5-51 were found more frequently than one would expect (data not shown). Similar nonrandom VH gene usage is seen in the peripheral blood B cells of healthy individuals . The only unexpected feature of the B cell rearrangements was an enhanced frequency of VH 4-39 usage. Although the number of tissue samples was small, this excess of VH 4-39 rearrangements was seen in three out of five patients analyzed. To examine the antigen-specific immune response within the inflamed synovium, we compared the V-gene repertoire used by B cells taken from the network of FDCs, from the T cell area and from the ring of plasma cells of individual lymphoid structures . This analysis showed that the repertoire expressed by the plasma cells was significantly different from that expressed in the CD20+ B cells isolated from the network of FDCs. In the plasma cells, there was a significant shift towards rearrangements of the VH4 gene family. This suggests that only a small fraction of the broad spectrum of B cells migrating into the FDC network are selected to differentiate into plasma cells. The low frequency of VH 3-23 rearrangements seen in the population of plasma cells (two out of 37 sequences) is in accord with this interpretation. The next question concerns the origin of these plasma cells. Although the analysis failed to identify plasma cells and CD20+ B cells with an identical rearrangement, the data are nevertheless in favour of plasma cell differentiation within the ST. Within the plasma cell population we found sequences with an identical rearrangement but a different pattern of somatic mutations , indicating that these plasma cells have developed from the same B-cell clone. One might argue that the intraclonal diversification occurred during B-cell activation in a GC of the normal peripheral lymphoid tissue. However, the probability that the descendants of a B cell activated in normal lymphoid tissue migrate independently into the ST and settle in close vicinity of the same follicle is extremely low. We favour an explanation that is based on the kinetics of B-cell development that results in a temporal dislocation of clonal relationships. In this scenario peripheral B cells continuously immigrate into the synovial lymphoid structures. Only those few that express appropriate V genes will be selected into a GC reaction and only those clonal descendants with high affinity for the selecting antigen will differentiate into plasma cells. The plasma cells that are present within a follicular structure are thus descendants of B cells that were activated days or perhaps weeks before in the network of FDCs. The B cells currently in the FDC network are the forerunners of the plasma cells that will develop over the course of the coming days and weeks. The central question that remains is which antigens drive the specific immune response and select B cells to differentiate. One possibility is that the synovial membrane functions as additional lymphoid tissue. In this case, the elaboration of a normal immune response is no longer restricted to the peripheral lymphoid organs, but can also take place in the ectopic lymphoid tissue that has developed in the ST. Another possibility is that we are dealing with an autoimmune response that is initiated in the synovial membrane. Though it remains unclear whether the synovial immune response is the causal basis of the disease, patients with RA do often have autoantibodies . The so-called rheumatoid factor (RF) are autoantibodies specific for the Fc region of self-immunoglobulin G. Indeed, around 60% of RA patients have high affinity immunoglobulin M, and immunoglobulin G and immunoglobulin A RF antibodies. These RF antibodies are useful prognostic markers, because seropositive patients have a more erosive and a more destructive disease. The extent to which B cells activated in the follicular structures of the ST have RF specificity remains to be determined. Interestingly, when hybridoma lines with RF specificity were generated from the ST of a patient with RA , two lines were found that expressed an identical VH gene rearrangement. The highly mutated line showed an increased affinity for self-immunoglobulin. These findings suggest that RF-specific B cells undergo affinity maturation in the ST.
Antibodies with RF specificity will lead to the formation of immunoglobulin complexes and by activation of the complement cascade enhance the chronic inflammatory process. Furthermore, B cells with specificity for self-immunoglobulin can bind and internalize immunoglobu-lin-antigen complexes and hence by generating a much broader spectrum of peptides lead to enhanced antigenpresenting function . This will support further activation and maturation of self-reactive B cells and thereby increase the production of high-affinity antibodies with RF specificity. If indeed the majority of the synovial B cells have RF specificity, this may lead to a continuous stimulation of the immune system and thus support the chronic inflammatory processes. There is as yet little evidence that antibodies are directly involved in tissue destruction. This question remains open, however. Intriguing recent evidence comes from a mouse model system in which it has been demonstrated that antibodies with specificity for a commonly expressed enzyme of the glycolytic pathway, the glucose-6-phosphate isomerase, induce RA-like symptoms . Whether autoanti-bodies of a comparable specificity are involved in the pathogenesis of human RA has to be established. The molecular analysis of the V-gene repertoire expressed in synovial B cells has demonstrated that within the inflamed synovium an antigen dependent immune response takes place. By combining the immunohistological information with the molecular data it will be possible to determine the specificity of those B cells involved in an antigen driven immune response. The aim is to microdissect single cells from the ST, analyze their V-region genes and clone them into expression vectors. This will reveal the impact of the ongoing immune response on the pathogenesis of the disease. Intraclonal diversification in synovial germinal centre. Genealogical trees showing the diversification of a DPL23 (Vλ 3 germline gene) and an O18 (Vκ 1 germline gene) rearrangement. Numbered circles represent isolated sequences. The DPL23 rearrangement was isolated from two independent polymerase chain reactions (prefixes 1 and 2), and the O18 rearrangement was from serial sections 1, 2, 4 and 5. Numbers beside the lines refer to the number of nucleotide exchanges by which one sequence differs from the other sequences. VH3 repertoire of synovial B cells. The number of the different rearrangments isolated from the synovial tissue samples of five patients with RA is given. VH3 sequences were compared with the known human germline genes . We thank RS Jack for critical reading of the manuscript. The DRFZ is supported by the Berlin Senate of Research and Education.